ZXing Decoder Online is a web based bar code decoder from ZXing, an open source project that’s also created Android and mobile Java bar code reader apps and a bar code decoding library. 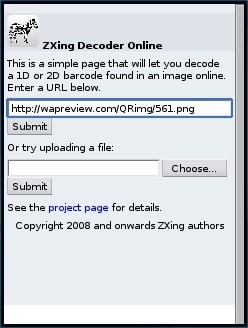 The ZXing webapp lets you decode 1D and 2D bar codes found in images online or images uploaded from your device. It displays the contents of the bar code which could be text, a phone number, vCard or a URL. The decoder could be useful if your phone doesn’t support any bar code reader apps. Many feature phones block 3rd party Java apps from accessing the camera. You can get around this limitation by taking a photo of the bar code and uploading it to the online decoder. Another use for decoder is to discover the target or contents of a bar code on a web page you are viewing. Either paste the bar code image’s URL into the decoder or save the bar code image on your phone and upload it to the decoder. Unfortunately the decoder doesn’t format URLs in bar codes as clickable links. It doesn’t format phone numbers or tel: URIs as click to call links either. You need to remember or write down URL or phone number or copy it from the results page (if your browser supports copying) and enter or paste it into the address bar or dialer. 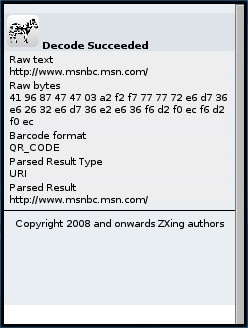 This entry was posted in bar codes and tagged bar code decoder, ZXing by Dennis Bournique. Bookmark the permalink.